Bluebird Gardens tips on how to keep bees. During my second winter of beekeeping, I lost a colony to starvation and vowed then and there if I could do anything to prevent that from happening again, I would. Since then, leading beekeeping scientists like Jerry Hayes have insisted there is nothing wrong with feeding bees. After all, we would not let Fido die from lack of food so why would we do that to our honeybees? The experience changed the way I manage my extra honey supplies. 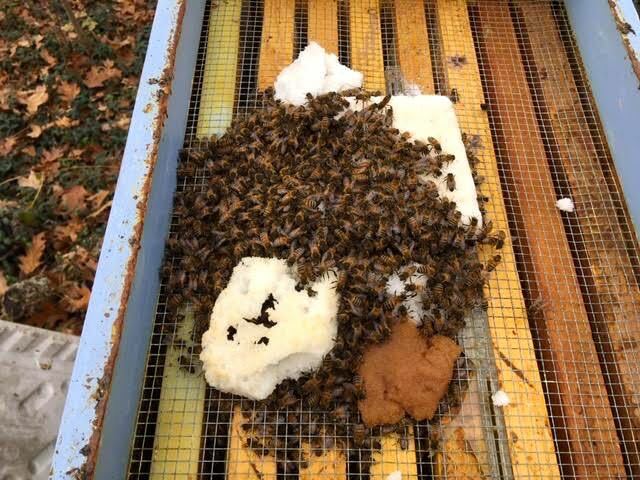 Instead of harvesting in fall, I pull frames during the year and use them in fall to make sure all of my colonies have at least one full honey super going into winter. My two largest colonies get two honey suppers. This year, a couple of my hives were short of honey stores so I supplemented with the saved honey. Then on a whim I checked one of my larger colonies without breaking the propolis seals and found there wasn’t one drop of honey left. Out came the totes with honey frames and an 8-frame honey super was added as the third box. As insurance, I also added homemade sugar cakes and small 1x1 inch winter pollen patties which are mostly carbs and little protein. Our mid-Missouri weather is fickle, fluctuating from record lows to sunny, balmy days. The fluctuating weather conditions means my bees are consuming honey and out flying on the warm days, consuming more of their honey stores than if they were clustered inside their hives staying warm. The homemade sugar cakes are easy to make. I use bread pans when they are available and recycled fruit clam shells when I am making extras. I knew I needed more sugar cakes for the honeyless colony so I used my bread pans and allowed the sugar cakes to dry for a day before putting them in the hive. 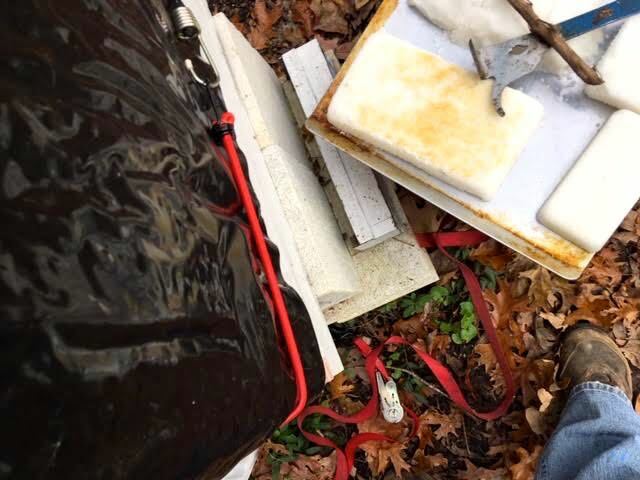 Each hive is wrapped in a quilted black plastic to help insulate them from the winds out of the south. It’s always interesting to see where the bees are when I remove the telescoping lid. 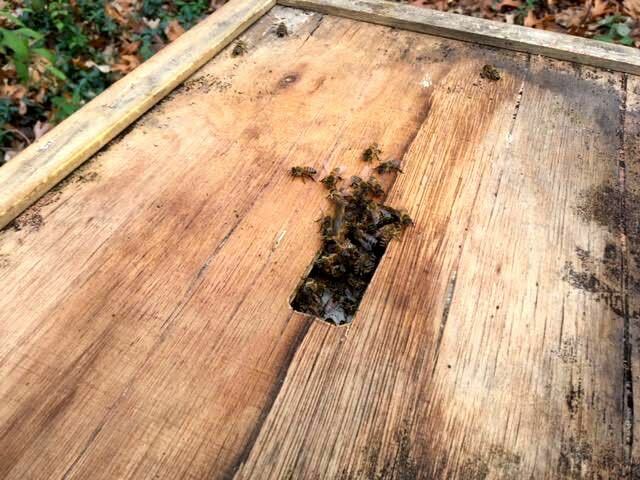 Each hive now has a solid inner cover with a hole in the middle that gives a hint of what I will find when I lift the inner cover. Our temperature today was 50F so it was a good day to add the sugar cakes without getting my bees cold. In addition to supplemental feeding, sugar cakes serve a second function, absorbing hive moisture. Bees in a cluster generate a lot of heat which can turn into condensation that then gets them wet. Too much moisture in a hive kills bees faster than cold temperatures. The warmer weather today meant more bees were hanging out in the top feeding shim where I place the sugar cakes and winter protein patties for a supplemental food source. It reminds me of a bee bar! This is another colony I checked today. They were given a smaller sugar cake more to provide moisture control. This last hive was the original colony that consumed all of their honey earlier this fall. This is the top feeding shim before I added the sugar cakes for supplemental food on top of their brand new super full of honey stores. The forecast for tomorrow is for snow and possibly ice so good thing we are all fed and tucked in!